For other uses, see Crooked House (disambiguation). Dust-jacket illustration of the UK first edition. 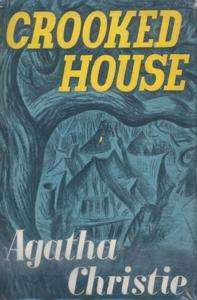 Crooked House is a work of detective fiction by Agatha Christie first published in the US by Dodd, Mead and Company in March 1949 and in the UK by the Collins Crime Club on 23 May of the same year. The action takes place in and near London in the autumn of 1947. Christie said this and Ordeal by Innocence were her favourites. It is one of only five Christie novels not to have received a screen adaptation (although one is planned) - the others being Death Comes as the End, Destination Unknown, Passenger to Frankfurt, and Postern of Fate. The title refers to a nursery rhyme ("There Was a Crooked Man"), a common theme of the author. Narrator Charles' fiancée Sophia says it refers not to dishonesty, but rather "we hadn't been able to grow up independent...twisted and twining," meaning unhealthily interdependent on the intensely strong personality of the family patriarch, Aristide. Three generations of the Leonides family live together under wealthy patriarch Aristide. His first wife died; her sister Edith has cared for the household since then. His second wife is the indolent Brenda, decades his junior, suspected of having a clandestine love affair with the grandchildren's tutor. After Aristide is poisoned by his own eye medicine (eserine), his granddaughter Sophia tells narrator and fiancé Charles Hayward that they cannot marry until the killer is apprehended. Charles' father, "The Old Man", is the Assistant Commissioner of Scotland Yard, so Charles investigates from the inside along with assigned detective, Chief Inspector Taverner. Towards the end of the Second World War, Charles Hayward is in Cairo and falls in love with Sophia Leonides, a smart, successful Englishwoman who works for the Foreign Office. They put off getting engaged until the end of the war when they will be reunited in England. Hayward returns home and reads an obituary in The Times: Sophia's grandfather, the wealthy entrepreneur Aristide Leonides, has died, aged 85. Due to the war, the whole family has been living with him in a sumptuous but ill-proportioned house called "Three Gables"–the 'crooked house' of the title. The autopsy reveals that Leonides was poisoned with his own eserine-based eye medicine via an insulin injection. Sophia tells Charles that she can't marry him until the matter is cleared up. The obvious suspects are Brenda Leonides, Aristide's much younger second wife, and Laurence Brown, a conscientious objector who has been living in the house as private tutor to Sophia's younger brother and sister, Eustace and Josephine. They are rumoured to have been carrying on an illicit love affair under old Leonides's nose. The family members hope these two prove to be the murderers because they despise Brenda as a gold digger and also hope to escape the scandal that a different outcome would bring. The police fail to turn up a suspect. Charles agrees to help his father, an Assistant Commissioner of Scotland Yard, to investigate the crime. He becomes a house guest at Three Gables, hoping that someone might reveal a clue at an unguarded moment. All the family members had motive and opportunity, none has an alibi, and each of them knew that Aristide's eye medicine was poisonous. According to the will, they all stand to gain a healthy bequest from the old man's estate. Aside from this, the family members have little in common. Edith de Haviland, Aristide's unmarried sister-in-law, is a brusque woman in her 70s who came to stay with him after his first wife's death to supervise his children's upbringing. Roger, the eldest son and Aristide's favourite, is a failure as a businessman. He has steered the catering business bestowed to him by his father to the brink of bankruptcy and he longs to live a simple life somewhere far away. Roger's wife Clemency, a scientist with austere and unsentimental tastes, has never been able to enjoy the wealth offered by her husband's family. Roger's younger brother, Philip, has suffered under his father's preference for Roger, and retreated into a distant world of books and bygone historical epochs, spending all his waking hours in the library. Philip's wife Magda is only a moderately successful actress to whom everything, even a family murder, is a stage show in which she wants to play a leading part. Sixteen-year-old Eustace has polio. He is handsome and intelligent, yet embittered by his disability. His twelve-year-old sister Josephine, on the other hand, is ugly, precociously intelligent, and obsessed with detective stories. She spies continually on the rest of the household, letting everyone know that she is writing down her observations in a secret notebook. Leonides had secretly redrafted his will to leave everything to Sophia. He believed that she alone had the strength of character to assume his place as the head of the family. Josephine had been bragging that she knows the killer's identity. She is found lying in the yard, unconscious from a blow to the head from a marble doorstop. Charles discovers a cache of incriminating love letters from Brenda to Laurence, and the two are arrested. While they are in custody, the children's nanny dies after drinking a digitalis-laced cup of cocoa that had apparently been intended for Josephine. The family realises that the killer is still among them. Charles, afraid for Josephine's life, tries in vain to induce her to tell him the murderer's name. Edith de Haviland invites Josephine to come out with her in the car for an ice cream soda. The car drives over a cliff and both are killed. Back at Three Gables, Charles finds two letters from Miss de Haviland. One is a suicide note for Chief Inspector Taverner taking responsibility, although not explicitly confessing, to the murders of Aristide and Nanny. The second letter, intended for Sophia and Charles only, reveals the truth of the matter. Josephine was the murderer. As proof, de Haviland has enclosed the child's secret notebook, the first line of which reads "Today I killed grandfather". Josephine killed her grandfather because he wouldn't pay for her ballet lessons; she then revelled in all the attention she received afterwards and planned her own assault with the marble doorstop as a way of diverting attention. She poisoned Nannie for encouraging Magda to send her to Switzerland, and also because Nannie called her a "silly little girl". She also included threats against Magda if her mother seriously considered sending her away. Miss de Haviland had discovered Josephine's notebook hidden in a dog kennel, and committed the murder-suicide car crash as she did not want Josephine to suffer in a prison or asylum if and when the police learned she was the murderer. Maurice Richardson, in the 29 May 1949 issue of The Observer gave a positive review in comparison to his opinion of Taken at the Flood the previous year: "Her forty-ninth book and one of her best seven. Poisoning of aged iniquitous anglicised Levantine millionaire. Nicely characterised family of suspects. Delicious red herrings. Infinite suspense and shocking surprise finish make up for slight looseness of texture." An unnamed reviewer in the Toronto Daily Star of 12 March 1949 wrote: "Chief Inspector Taverner of Scotland Yard was as brilliant as usual but barking up the wrong tree – as Agatha Christie demonstrates in a surprise ending which introduces a novel idea in murder mystery." Robert Barnard: "'Pure pleasure' was how the author described the writing of this, which was long planned, and remained one of her favourites. As the title implies, this is a family murder – and a very odd family indeed. The solution, one of the classic ones, was anticipated (but much less effectively) in Margery Allingham's 'prentice work The White Cottage Mystery." In the "Binge!" article of Entertainment Weekly Issue #1343-44 (26 December 2014–3 January 2015), the writers picked Crooked House as an "EW favorite" on the list of the "Nine Great Christie Novels". The novel was adapted for BBC Radio 4 in four weekly 30-minute episodes which began broadcasting on 29 February 2008. It starred Rory Kinnear (Charles Hayward), Anna Maxwell Martin (Sophia Leonides), and Phil Davis (Chief Insp. Taverner). The radio play was dramatised by Joy Wilkinson and directed by Sam Hoyle. It was subsequently issued on CD. This version removed the character of Eustace. In 2011, US filmmaker Neil La Bute announced that he would be directing a feature film version, for 2012, of the novel with a script by Julian Fellowes. On 15 May 2011, Gemma Arterton, Matthew Goode, Gabriel Byrne and Dame Julie Andrews were announced to lead the cast. In a report issued on 10 June 2012, Sony Pictures Worldwide Acquisitions acquired all rights in the US, Canada and internationally for the film, which could help secure it a lucrative release – but it should also be noted the report states that casting is about to gear up in London as the film is set for a fall production start, suggesting that the initial cast line-up may have been changed for now. As of 2016, the director of the film is now Gilles Paquet-Brenner, and will star Christina Hendricks, Gillian Anderson, and Glenn Close. A condensed version of the novel was first published in the US in Cosmopolitan magazine in the issue for October 1948 (Volume 125, Number 4) with an illustration by Grushkin. In the UK the novel was first serialised in the weekly magazine John Bull in seven abridged instalments from 23 April (Volume 85, Number 2234) to 4 June 1949 (Volume 85, Number 2240) with illustrations by Alfred Sindall. ↑ "Binge! Agatha Christie: Nine Great Christie Novels". Entertainment Weekly (1343-44): 32–33. 26 December 2014. ↑ Eden, Richard (20 March 2011). "'Downton Abbey' creator Julian Fellowes to make Agatha Christie fashionable again". The Daily Telegraph. London. ↑ Higgins, Charlotte (15 May 2011). "Cannes 2011: Neil LaBute turns his macabre hand to Agatha Christie". The Guardian. London. ↑ Holdings at the British Library (Newspapers – Colindale). Shelfmark: NPL LON LD116.